Washing soda is a type of additive. Additives (also called assistants or fixatives) can change the color of the dye by making the solution either more acidic or alkaline. Last year I used washing soda to turn my coreopsis dye from orange to almost red. 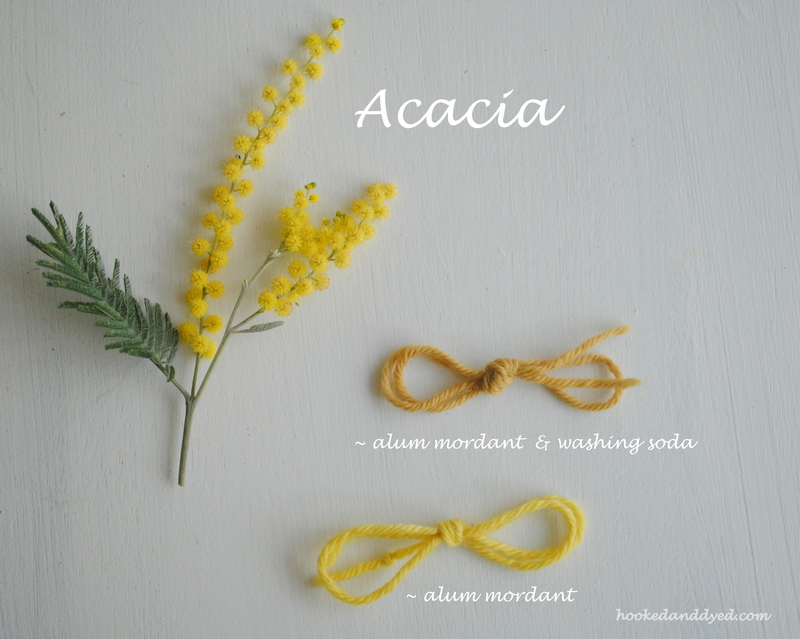 It was such an easy method to make two colors with one plant, I wanted to see how washing soda would affect the dyes I made with acacia and oxalis flowers. Warning about using washing soda – a little can go a long way! 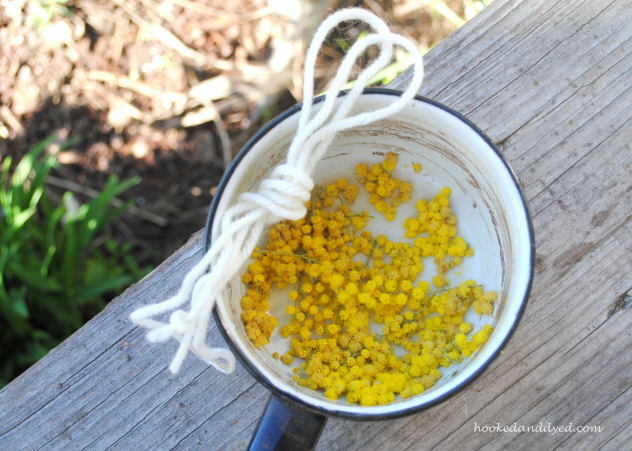 If you add too much, it can roughen or even dissolve the wool. My schedule these days feels more hectic/busy/crazy then normal. (How is this possible?) Therefore, my dyes have become mini experiments. My dye pot is the size of a sauce pan. 1. I dyed my samples without the additive and pulled the yarn out once I achieved yellow. 2. I removed the pot from the stove and added 1/8th of a teaspoon of washing soda into dye. (For a normal dye pot amount, I add 1/2 teaspoon at a time until the color changes). The washing soda will immediately change the color of the dye – it’s awesome to watch. 3. I returned the yarn to the pot and let it sit in the dye until the yarn changed color. It’s almost like a double dye. 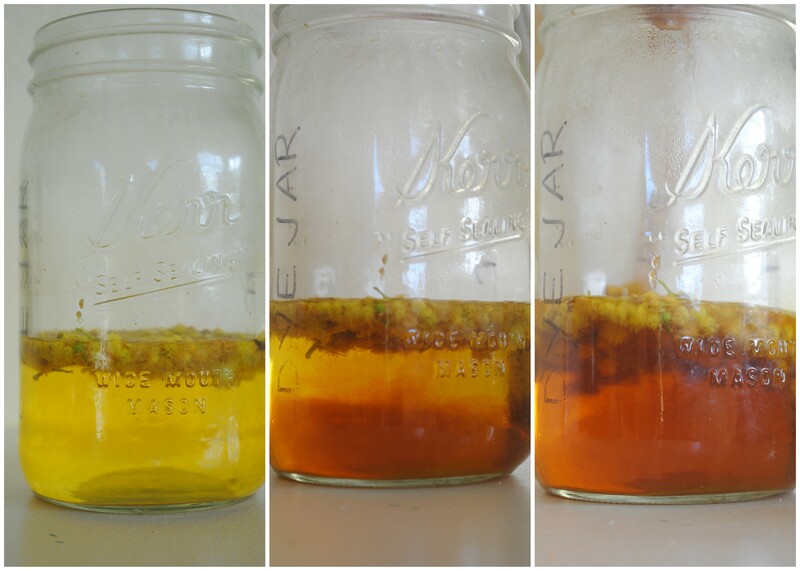 I showed my kids this process by pouring the dye by into a glass mason jar. Science FTW! I love this experiment. very cool. love the oxalis with washing soda. thanks for sharing these results! 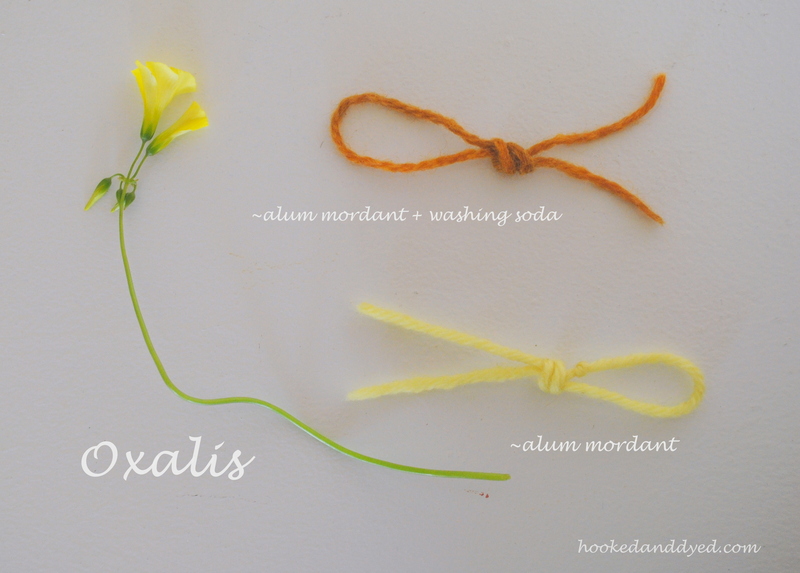 The orange result from the oxalis with washing soda was a pleasant surprise! I’m a VERY beginner dyer, and the info on washing soda was fascinating! I started experimenting with it in my various solar dye experiments. I had a beautiful purple colored bath made out of the scraps from the purple kale I pulled up from the garden. Turns out, the kale does not do much of anything on its own (at least not that I’ve been able to achieve! ), but I split the bath into two jars and added a bit of washing soda to one and it turned forest green! Since the straight kale bath didn’t dye my alum mordanted yarn at all, I didn’t think the kale w/ WS would, either, but I let it sit for a week, just to see. It actually kept a pretty soft mint color when I finally washed it out. I have no idea how long the color will hold, but it was so much fun to experiment! Laura, I feel like a beginner dyer, too! What a neat experiment – that’s cool the washing soda turned the dye from purple to green. I know that with the mushroom Omphalotus, the dye can be either purple or green, depending on the mordant (alum versus iron) and by changing the pH.